The Palais around the corner from Musil and Wittgenstein | continent. Charles-Antoine Delanglard's idea was as simple as it was brilliant. He simply inverted the globe and opened up the inside. Inquisitive visitors were now able to cast their eyes across the Pacific Ocean, let them linger on St. Petersburg, the Sahara desert and Zanzibar while standing on a platform at the new Parisian landmark. Georama was the name the ingenious tax inspector chose for his invention, which made it possible to take in the entire surface of the earth from a perspective that the globe we are all familiar with was never able to offer. Delanglard opened his Georama in May 1825 on a site between Rue de la Paix and the Boulevard des Capucines. Almost eighty years later, two huge, openwork design gilded globes crowned a new building in the Viennese Löwengasse, a palatial corner house with an immediate connection to the French capital. The globes that were supported by female figures wearing black gloves referred to the enterprising owner's international activities. Accordingly, they were paired with inscriptions including »London« and »New York« that adorned the bays and balconies on the richly decorated façade of the building. The proud inscription in the stone above the portal of the publishing house – for that is what this building was – read »Palais des Beaux Arts«. The man who had commissioned this remarkable building was Arnold Bachwitz, who was born in 1854 and arrived to Vienna from Halle an der Saale. He was intensely interested in fashion and opened a studio for fashion drawings on Hoher Markt. Soon, he undertook regular trips to Paris in order to visit presentations there. Bachwitz must have had an extremely good sense for future trends; his business in Vienna flourished during the “Gründerzeit”, a period of massive growth for the capital of the Danubian monarchy around the turn of the century. This is how the new building in Löwengasse came about: Bachwitz needed space for what he called the Chic Parisien fashion albums and wanted spacious rooms. The busy pair of brothers Anton and Josef Drexler tackled the task: »What is the building to look like?«, they asked. »Grand!«, explained their enthusiastic commissioner Bachwitz. »Like in Paris! And a little romanticizing!« And so it was done. Bachwitz had created a French enclave in the Viennese district of Landstraße near the Danube Canal, where hundreds of people had found employment. There were diligent colourists – every issue was hand-coloured. As implied in the above-mentioned façade inscriptions, staff members were busily manning the telephones in the export department, constantly collecting information on the sales of the issues and recording new orders from the general representatives of the Bachwitz products in London and New York. The studios were located in the light-flooded rooms facing the interior courtyards on the top floor. This is where those very designs for blouses, dresses and coats were created that would go on, as drawings and patterns, to enchant both the sophisticated ladies and many Viennese tailors. The lower ground floor facing Löwengasse housed the printing press for many years, while the garage where Arnold Bachwitz himself also parked his car faced Paracelsusgasse. The publisher's private family apartment was, as would be expected, located on the first floor, just above the Palais' noble inscription. The last floor facing the street front, finally, held a gallery that was open to the general public every day; it showed works by the likes of Hans Canon, Hugo Charlemont, Hugo Darnaut, Friedrich Gauermann and Moritz von Schwind, and offered them for sale. Let us not forget that Arnold Bachwitz was also one of the donors for the Künstlerhaus. 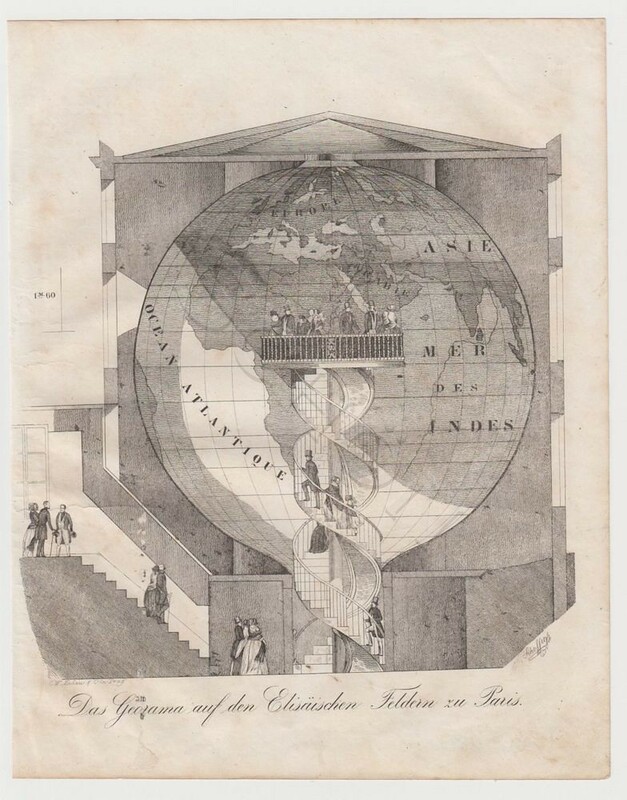 Bachwitz and his employees thus in some ways found themselves as if, like in the Paris Georama, on the inside of the globe(s). It hardly comes as a surprise, therefore, that it was in this building that Die moderne Welt (The modern World) was published from 1919 onwards, a magazine of art, literature, reportage and, obviously, fashion. The magazine team was certainly illustrious: the writers included Raoul Auernheimer as well as Ea von Allesch. The latter went down in history as the lover and muse of writer Hermann Broch, whom she was known to pick up from the editorial office. Gustav Klimt had several years previously painted a portrait of this Viennese lady, Wasserschlangen II. She was, however, also and foremost an independent, widely interested and hard-working woman who was certainly not content to acts as a mere accessory. We do not know (yet) whether Allesch also, like so many other employees of the Bachwitz company as well as the publisher himself, liked to visit the Café Lovrana across the street. (Others preferred to take in their Viennese coffee in the equally nearby Café Zartl – like so often, it was a matter of faith). The café on the corner of Löwengasse 36 and Rudolf-von-Alt-Platz 1 was named for a spa resort near Abbazia/Opatija; over the years it developed into a vibrant meeting point for people of a range of interests. The location served, among other things, as the assembly rooms for the Landstraße department of the Austrian Zionist organization, Zionistischer Landesverband Österreich: gazing at the publishing house globes through the windows of the café, its members were finding a new home in Palestine for the Jews who were suffering persecution in the diaspora. »Sitting at the very centre of Europe, where the old axes of the world intersected«, explained Robert Musil in his Man without Qualities: this sentence describes »Kakania«, and is just as applicable to the Palais des Beaux Arts. Musil himself was very familiar with the building and the annex erected in Paracelsusgasse 9 a few years later. For one, he was obviously a friend of Ea von Allesch. Further, he lived in the immediate vicinity, it being only a few minutes' walk down Rasumofskygasse to his apartment, where he penned the above-mentioned novel that was to become one of the most influential books of literary modernity. One street along, on Kundmanngasse, Ludwig Wittgenstein and the Loos-student Paul Engelmann erected a house for his sister Margarethe Stonborough in 1926-1928, which – separated from Musil only by the Palais Rasumofsky and the Landstraße grammar school – was able to astonish not least with what Bernhard Leitner called the »aesthetics of weightlessness«. In his Tractatus logico-philosophicus, Wittgenstein propositioned that »the world divides into facts«. While the nearby Wittgenstein house, where intellectuals of the Wiener Kreis frequently came together, is located on the former grounds of a nursery, the houses around the Palais des Beaux Arts are spread across an area that used to belong to the British company Clayton & Shuttleworth as production site. This successful company's site had reached as far as Marxergasse and Kegelgasse; they produced agricultural equipment and had branches in Budapest, Prague, Lemberg as well as Czernovitz. The business, granted immortality in Heimito von Doderer's The Waterfalls of Slunj, moved to the outer Viennese district of Floridsdorf in around 1905. The entire quarter was subsequently redesigned. The Palais des Beaux Arts was erected in 1908–1909, the annex on Paracelsusgasse was added in 1912. The Drexler brothers for their part found a new home in the corner house of Löwengasse 34 and Rudolf-von-Alt-Platz 7, also by their own design. Arnold Bachwitz, who is described as a generous and terribly kind boss by descendants of his former employees, lived and worked at the Palais des Beaux Arts until his death in 1930. In the following years, the business was led by family members, but the exhibition of paintings on the last floor was closed. Disaster struck with the 1938 »annexation«: Rosine Bachwitz, Arnold's widow, was murdered during the Holocaust, as was his daughter Alice Strel. Another daughter, Grete Lebach, had relocated to Berlin as a successful businesswoman and entered the history of science as a close friend of Albert Einstein. She died in undignified circumstances at the Viennese Rothschild hospital in August 1938. The publishing company itself as well as the building were »arianized«; the building was used to house a department of the NS-Luftgaukommando. By this time, Margarethe Stonborough-Wittgenstein had long escaped into exile, as had the other former »neighbour« Robert Musil. To find details about their life stories, and to read more about the Palais des Beaux Arts, visit Wikipedia – that collaborative platform with a globe for a logo.